Many of the tours which depart from Banff, pass through Lake Louise which cuts down on travel time and gets you on your guided tour or activity sooner! More tours are available out of Banff, so if you want to do more than just skiing and snowboarding, then staying in Banff maybe a better option. 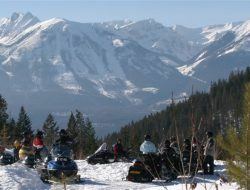 Listed opposite are the available winter tours and activities to choose from which depart out of Lake Louise. Click on the links for more information or check out some of our advice on Lake Louise winter tours below. From Banff you do have access to three ski resorts included with your Tri-Area Lift pass: Banff Norquay, Sunshine Village and Lake Louise. There is also the option to ski and snowboard at other ski resorts such as Kicking Horse Ski Resort and Panorama Mountain Village for little more than a cost of a day ski pass. The Kicking Horse Powder Express and Panorama Ski Day Bus are both worth considering if you are wanting to try out another ski resort for the day. The Lake Louise and Icefields Sightseeing Tour takes you to some spectacular scenery. The Icefields Parkway is a breathtaking highway to Jasper and you will travel along it to Bow Lake. Taking a guided Banff Snowshoe Tours is the safest option to go for an enjoyable stroll in the snowy wilderness. These modern snowshoes have come a long way since the old tennis-racquet styling! Wildlife is still about in the winter time so a Banff Winter Wildlife Sightseeing Tour around Banff will be sure to find something for you to photograph! These guides know exactly where to find the wildlife and provide an interesting commentary. This is the ultimate après-ski party in Banff National Park. Transportation to your Lake Louise or Banff hotel available. If the Lake Louise winter tour you are interested in is not listed above, please contact us and we will do our best to help.